The Southwest is one of the best places on earth to search for gems and minerals! Do you want to know where they can be found? Then check out our new 40-page eBook! 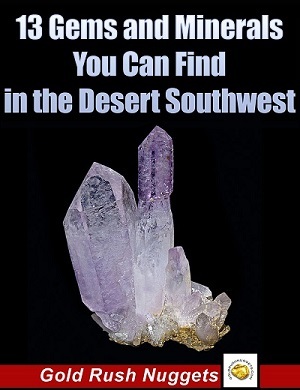 13 Gems and Minerals You Can Find in the Desert Southwest is packed with locations where a variety of valuable minerals and gemstones have been discovered. There are still many undiscovered mineral deposits out there just waiting for someone to go out and find them! *Turquoise *Opal *Jade *Amethyst *Jasper *Beryl *Peridot *Azurite *Malachite *Fossils *Tourmaline *Wulfenite *Vanadinite! 30-day Guarantee! We know that this guide will help you search for minerals in the Southwest. If for any reason you are not satisfied, we will gladly give a full refund. We offer this 30-day guarantee because we know that this eBook will help you research areas to search for gems and minerals! Start finding some gems and minerals to add to your collection today!